The Spurs were injured, but Golden State was expecting a fevered fight on the home floor of the five-time NBA champions. 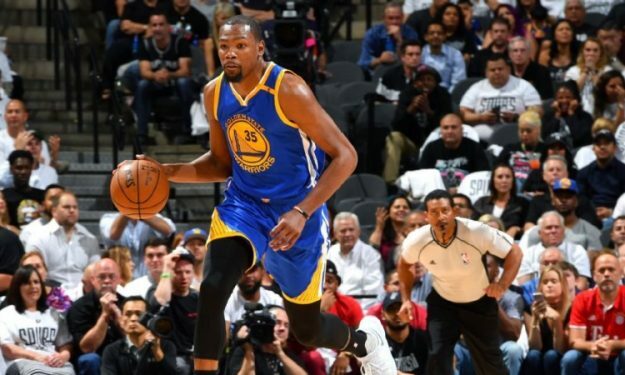 Still Kevin Durant had 33 points and 10 rebounds and Golden State beat injury-riddled San Antonio 120-108 on Saturday night to take a 3-0 lead in the Western Conference Finals. Already without leading scorer Kawhi Leonard and starting point guard Tony Parker, the Spurs lost David Lee to a left knee injury in the opening quarter. He has been diagnosed with a partially torn patellar tendon in his left knee and will have an MRI on Sunday to confirm the injury. For the winners also Georgian Zaza Pachulia missed the game due to injury, while Spaniard Pau Gasol had a double double for the Spurs (12 p. 10 r.) and Latvian Davis Bertans added two points.